Hello, Granners! It has been a while since I've been able to write to you, and I'm sorry about that. For the last year or so we've been working hard on some new products. But while products are under development I can't really tell you much about what we're doing. For instance, recently we launched our Embrilliance Thumbnailer program. The Embrilliance Thumbnailer provides an easy way for you to view embroidery designs on your Mac and PC. I started this project back in 2000 when I wrote the original Designer's Gallery, but couldn't get it to work, probably because I was developing on Windows 2000, which had a lot of NT in it. Later, XP made it possible, and I had a few friends asking for it, but by then, other folks had done them so I left it alone. They did a reasonable job, and I had no intention of stepping on their toes. I had other programs to write. So I do want to give credit to others for doing this first. Then in 2007 we started writing for the Mac in earnest. Following the successful launch of Convert It, Mac (CIM) in 2008, we saw that this product came naturally, so in 2009 we released it there and made it free to CIM owners. We still had plans for the product sitting on the shelf in 2009 because, having looked around on the Windows side, no one was able to make their icons work completely in Windows Vista, or later Win 7, particularly on the 64 bit machines. Still, I didn't jump on it until I had a distributor ask for it. They had evaluated what was available for the market and for whatever sundry reasons, usually installation or compatibility issues, they couldn't accept the current product offerings. In a conversation, they simply said, "You know what we need..." And I said, "You know, I have a lot of that done already." It has been very well received, and we are so grateful! And we're still working on it some more; We've just about got it working to look INSIDE .Zip files. Registered owners can even test the next version by downloading it from the downloads page. Every embroiderer needs to do some basic things. Those things should be easy and fun, not an hour long trip to the dealer for a class. And it shouldn’t cost an arm and a leg, either. And just because your computer is a Mac with OSX or a PC with Windows 7 64 doesn’t mean you should be left out! Embroidery software should be easy and fun and useful for everybody. A couple years ago, I was with someone who told me what they like to use in their software. And then I heard the same thing from someone else. And it occurred to me that there are some things which are, "Essential to every embroiderer." Yet many software programs have everything and the kitchen sink too, and they charge you for it. So I put just those things in one simple, inexpensive program, and called it, "Essentials." 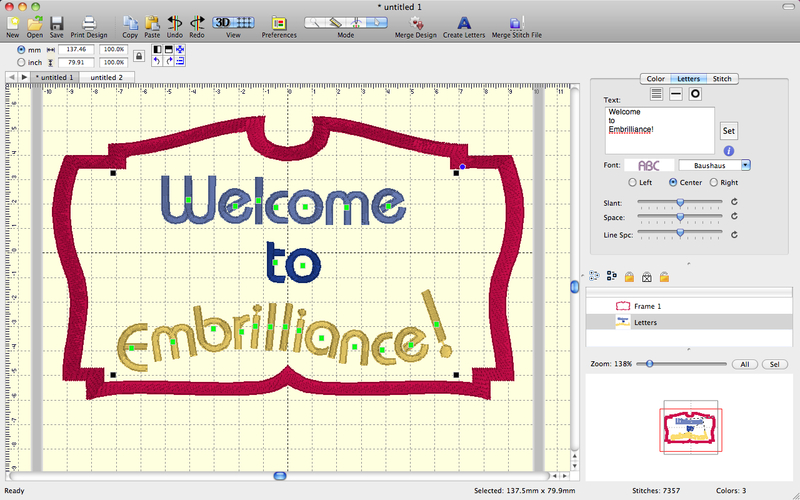 Merge embroidery designs in almost any format, even while they are in .ZIPs. Convert Thread Brands on your designs. Add lettering in Multi-Line, Monogram and Circle modes. You can even spiral text or make really LARGE letters. 12 Fonts included. Others are available. See Essentials Font collection 1 here. Save in your machine’s format. Save working files so that you can edit text later. Overlap designs and have significant understitching removed. Run a simulator to show how your designs will sew out. Change or remove individual colors in a design. Save in most machine formats (conversion). Have many chances to Undo your work. There are special, self-modifying designs that can be used, and some come with the program. These designs calculate their stitches as you play with them for super results! Intel Mac OSX 10.5 (Leopard) and later. Windows XP 32-bit, Windows Vista 32/64, Windows 7 32/64 . I don't want this to be too much of an ad, and I know it gets that way sometimes. All I can say in defense of that is rather than a large corporation, we're a small team that wouldn't know what else to do with ourselves if we couldn't write embroidery software. We don't golf, fish, or engage in any healthy activities. Writing embroidery code is what we do. And making embroidery easier and more fun is our mission. We look forward to hearing your feelings about this program. Do you like the idea of its simplicity? It is counter to the 4D/5D or PE-Design for instance, as those try to be all-inclusive. And they are priced that way. There are slice-and-dice editing and file-splitting and conversion programs out there. Some are reasonably priced. But those features didn't feel like things that were, "Eessential to every embroiderer." So after a couple years work, we humbly await your feedback. How does this compare with Janome's Customizer 1100 which I don't believe splits designs? We're probably going to buy an iMac this year and I was wondering about software for my machine. I have a Brother 1500D and use PE-Design 7, which is not very easy to use, the Help is not, and most times I need advice at 10:15 pm when my dealer is closed. I'm very familiar with Photoshop and have a zillion fonts on my computer -- some of which will transfer to the Mac. Is Embrilliance the software for me? I'm very new to all of this computer stuff. I purchased the Embrilliance program and thank you, thank you, thank you. I've been having the best time using it and best of all, it is easy to understand (I'm a bit computer illiterate). My husband is my I-T guy and I'm lost without his help. We're looking forward to the digitizing program y'all are working on next. Again, thank you sooooo much.